It’s mind boggling that the commercial harvest of Atlantic menhaden has operated with virtually no limits since, well, forever. Currently, this fishery ranks number one in landings, by volume, for the entire East Coast and second nationally behind Alaskan Pollock, according to NOAA’s website. The brakes were pumped on the full-throttle catching last November when the Atlantic States Marine Fisheries Commission finally set harvest and population targets with requirements to reduce landings beginning in 2013. And while the consensus among most fishery professionals is that stocks are at a historically low level and that overfishing is occurring, how much to cut and who gets what percentage of the take represents a formidable challenge when the ASMFC’s menhaden board meets in Baltimore on Dec. 14. 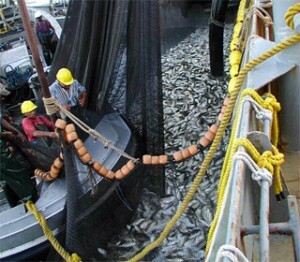 Coastal Conservation Association – Maryland Chairman Ed Liccione said his organization wants a 25 percent reduction in the overall menhaden harvest. His group also wants a 30-70 percent split between the bait market – used by crabbers, lobstermen and sport fishermen — and the reduction fishery, in which Omega is the sole player processing tons of bunker into products such as animal feed and cosmetics. According to Lynn Fegley, deputy director of Maryland’s Fisheries Service who sits on the menhaden board, the major tasks will be establishing a coast-wide quota, implementing catch monitoring and reporting protocols and data collection. The path forward is also complicated because some scientists question the most recent menhaden assessment, saying the model does not fit the data. As a result, the bunker board will use an alternative approach to determine 2013 harvest limits. Essentially, they can choose to use catch data from the previous three or five years, or some combination as long as it is not more restrictive. To that they’ll apply a multiplier (e.g. – .9 or .75) to determine new harvest limits for next year. These “bunker” are the life source for birds of prey that make their living at sea and almost all gamefish we love to fish for, like stripers. State legislators for Virginia have been paid off by Omega before. Make sure to click and send in your comments. This is a big deal! Once the more conservative rules are adopted there’s no guarantee Virginia, where a large percentage of bunker are netted, will go along. Disregarding the new rules would risk losing crucial federal funding, but the state’s General Assembly, which has regulatory control over bunker, has in the past sided with Omega. Heck, given their past heated rhetoric don’t bet against Omega suing if they argue the cuts are too severe. These are unlikely, yet not improbable, scenarios. The smart money is on some form of compromise. Bill Goldsborough, fisheries director for the Bay Foundation and ASMFC member who for years has been a calm head in fisheries squabbles, says he gets a growing sense (from opponents) that cuts to the menhaden harvest are not only inevitable but necessary. If all of this has made your head spin, I’m right there with you. Yet despite the complicated work of creating new bunker rules and the unknown political fallout, any delay in reducing next year’s menhaden harvest is unacceptable. Let the ASMFC know where you stand on the issue, via email at comments@asmfc.org. The comment deadline is November 16, 2012.